Florida public schools will be required to display “In God We Trust” signs on school property starting this week. Florida Gov. Rick Scott signed a bill passed by the state legislature in March that would require all Florida public schools to include a display with the motto “In God We Trust” in visible places on school property. The legislation is set to go into effect this week, the New York Post reported. The law states that “each district school board” is required to display the motto in every school building and school board office in the district. “In God We Trust” has been Florida’s state motto since 2006, but the phrase has been on Florida’s state seal since the mid-1800s and has appeared on the state flag since 1900, according to the Florida Department of State. Schools in the state told WPTV they have already started to display the motto in one form or another. The Palm Beach County School District announced it emailed every principal in the school district two signs, instructing them to print one and post it somewhere visible within the school building. Okeechobee County schools decided to display the state seal with the statement in each of their buildings “in a prominent spot,” and the Martin County School District also announced it had posted the signs in its schools. Even though “In God We Trust” is a Florida state motto, the phrase is also a national motto displayed on many U.S. coins, and there has been a movement among state legislatures within the past year to pass legislation requiring the motto be displayed in public schools and state government buildings. 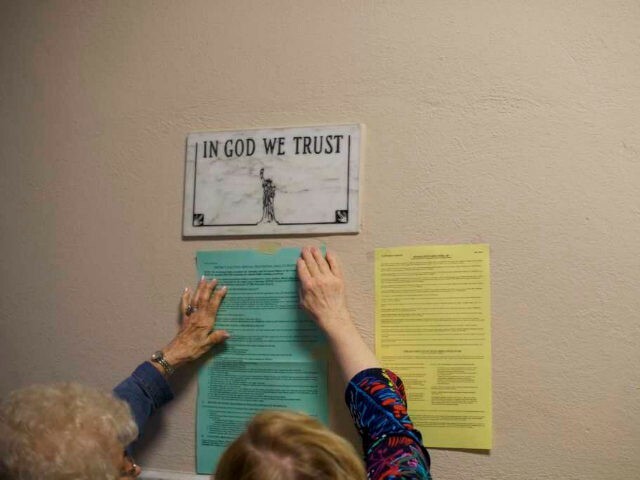 Alabama public schools also began placing signs with “In God We Trust” in prominent places within school buildings because of recently passed legislation that went into effect in July. Additionally, lawmakers in Arkansas and Tennessee passed laws requiring public schools to post the phrase. Arkansas public schools rolled out “In God We Trust” posters in November after the state passed legislation in August allowing the motto to be displayed on school property, and Tennessee lawmakers passed a law in March requiring public schools to post the national motto in a visible area of school property.